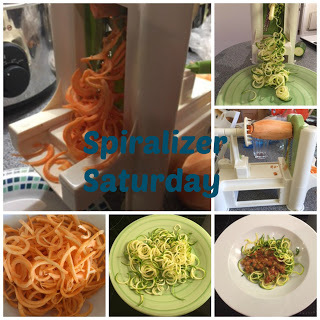 Welcome to my second Spiralizer Saturday! As part of my January health kick I’m going to use my spiralizer for dinner once a week as a way to get myself eating more vegetables, fewer carbs and generally have a healthier meal. If you have a recipe that can be made using a spiralizer please add it to the linkup at the end of this post. Sausages: if standard size, 2-3 per person. 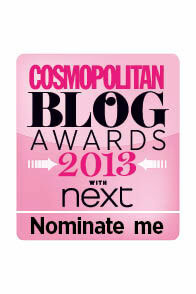 If chipolata, you will probably want more. The sausages can be raw or cooked – see instructions below. If you are using raw sausages, chop with scissors and fry them with the onion in a little oil until cooked. If using leftover cooked sausages, fry the onion as above then when the onion is translucent, add the chopped cooked sausage. Put the tomatoes, salt, oregano and 100ml water in the pan and simmer until the sauce has reduced. Meanwhile peel the butternut squash and cut the ends off so each end is flat. Place in the spiralizer and choose whether you want thin spaghetti style noodles or thicker, fettucine style – I went for the thicker ones for a change as I hadn’t done that before. There are various ways you can cook spiralized veg - boil, or rather blanch, as they only take a couple of minutes; fry in Fry Light or similar, or oven bake. I already had the oven on as I was serving my fiancé's ragu with spaghetti and doing him garlic bread as well so laid out the butternut squash noodles on a baking tray, sprayed them with Fry Light and roasted them in the oven for about 15 minutes. They turned out really well. Serve the ragu over the top and enjoy. If you have a recipe that can be made using a spiralizer please add it to the linkup below.